Upon it’s completion in 1936, the San Francisco-Oakland Bay Bridge was recognized as the greatest bridge in the world for its length, cost, weight, depth, amount of steel and concrete used, number of piers, and versatility of engineering. 4 LUBRON TF 2025 kip spherical bearings and expansion bearings were installed in 2001 as part of a $700 million seismic retrofit. Completed in 1909, the Manhattan Bridge in New York City connects Manhattan and Brooklyn across the East River. The double-deck suspension bridge is crossed by approximately 150,000 vehicles and 220,000 subway travelers each day. As part of a $646 million reconstruction project started in the early 1990's, LUBRON SL bearings were installed in the refurbishment of the lower roadway suspended side spans in this historic and architectural monument. Built in 1932, the Bixby Creek concrete arch bridge is one of the most photographed bridges in the United States. 16 LUBRON TF spherical bearings were installed in 1999 during the Bixby Creek/Rocky Creek seismic retrofit designed to preserve these historic structures. As one of the world’s largest dams, Hoover Dam is a National Historic Landmark and rated by the American Society of Civil Engineers as one of America’s 7 Modern Civil Engineering Wonders. Over 8,000 LUBRON AQ bearings have been installed in the emergency gate roller trains. Completed in 1951, Grand Coulee Dam was the largest concrete structure in the United States, and the third largest hydroelectric facility in the world. Over 5,800 LUBRON AQ bearings have been installed since 1992 in the dam’s penstock coaster gates. New York Power Authority’s Niagara Power Project consists of the Robert Moses Power Plant and the Lewiston Pump-Generating Plant located near Niagara Falls. When it was opened in 1961, the Niagara Power Project was the largest hydro- electric facility in the Western world, and remains today the largest producer of electricity in the state of New York. in turbines at 4 New York Power Authority hydroelectric plants. 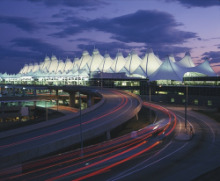 Opened in 1994, the $237 million Denver International Airport terminal complex features one of the nation’s largest cable-supported fabric roofs. A total of 42 LUBRON TF spherical bearings were installed to support the roof masts and struts. Miller Park Baseball Stadium, built in 2001 and home of the Milwaukee Brewers, features a domed retractable roof consisting of 5 triangularly shaped and arched moveable panels. 40 LUBRON SL split flange bearings have been installed in the bogie carts used to open and close the roof. Carver-Hawkeye Arena, one of the 10 largest university-owned facilities in the nation, opened in 1983. 8 LUBRON TF spherical bearing assemblies were installed for the roof supports. The Nanhai Tiao Zhan Floating Production System (FPS) is located in Amoco’s Liuhua 11-1 oil field, the largest oil field in the South China Sea. A total of 22 LUBRON AQ bearings were furnished in 1994 for the fairleads used to anchor the converted semi-submersible drilling rig at depths of 1,000 feet below sea level. Completed in 1996, the Neptune was the world’s first spar, a floating oil production platform designed for deep waters. LUBRON AQ bearings were installed in the fairleads, which are used to secure the floating platform to the ocean floor. The world’s largest movable flood barrier, the Thames Barrier was built in 1984 to protect London from tidal flooding. The Thames Barrier’s massive gates are positioned end-to-end across the Thames River ready to stem high tidal surges. LUBRON AQ spherical bearings are currently being employed to move the gates. flawlessly since the first launch of the Atlas V rocket on August 21, 2002. U.S. Navy Nuclear Attack Submarines SSN716, SSN717, SSN718, and SSN759 have been fitted with LUBRON AE expansion bearings. Other U.S. Navy submarine applications include LUBRON AQ bearings supplied for outboard anchor winches. The Solar Electric Generating System (SEGS) located in the California Mojave Desert is the largest commercial solar plant in the world. Consisting of 9 solar plants, SEGS provides a low cost source of clean energy, equivalent to 2 million barrels of oil needed to produce electricity annually. Over 275 LUBRON SL high temperature bearings have been installed in the heat transfer fluid pipe supports. LUBRON AE spherical and expansion bearing assemblies were supplied for the steam generator and reactor supports designed by Combustion Engineering for 9 nuclear power stations, including Arizona Public Service’s Palo Verde Units 1, 2 and 3. Over 75 nuclear plants throughout the world are equipped with LUBRON AE bearings.